I have never tried them-they look delicous! i love this too! !can have it anytime yes but making them is such a challenge especially with the hole in the middle! I have been craving for these vadas from yesterday, delicious coconut chutney to enjoy with that vadas. Weather is so gloomy so i feel it resistible. A popular favourite. Nicely made. Oh my goodness. These look too delicious for words! I love it! vada luks perfectly done...never feels bore 2 eat...yummy. 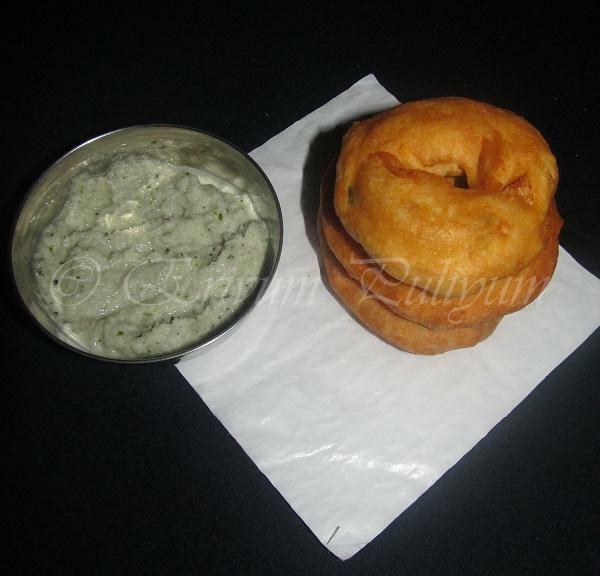 Wow..Perfect Spongry vadai tempts me to have with chutney right now..
they have turned out beautifully! even i find is a hassle to make in blender! Super like,my fav vadas,makes me hungry Julie..
Last week for new years I made the pepper added vadai and it came out well. Do you know if you fry half way until the vadai turns light brown, remove it from oil allow it to cool and then fry it once more. It is so crispy. I just happened to do it and I understood that this is how most restaurants do it. They refry before serving and we think their vadai's are crunchy. Try it next time. The vadai's look good. Giving a proper shape is the most difficult job here, your looks good. perfect vadas!.always an all time favourite snack! I love these especially if eaten it with fresh green chillies. We would take a bit of the vades and a bite of fresh green chillies and chew them together. Wonderful. They look like our loukoumades! Delicious snack! Oooh uzhunnu vada!! one of my all time fav snacks! Perfect vadas... I feel they are tough to perfect... You have done a great job! Loved your tip,Thanx..will try next time!! Wherever you go Vada is the snack you crave for! Beautiful pictures.